In the first twist of fate of 2018, couples agonised as the ever-anticipated Valentine’s Day coincided with Chinese New Year preparations – causing plans to derail, be pushed forward and time to run out. This may be a blessing in disguise as the opportunity to plan for the most romantic getaway or dinner presents itself through Chinese Valentine’s Day – Chap Goh Meh! Long ago, single Chinese women were confined to their houses, and Chap Goh Meh was the only day of the year that they were allowed to go out. To hasten the process of finding a life partner, these women would gather by the river and throw oranges. This rite of passage was a way for them to seek the deities’ blessings to be bestowed with a good man. Over the years, Chap Goh Meh has evolved to become a day to celebrate love – a second Valentine’s Day, in a way. 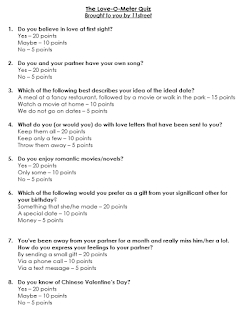 Whether you know your partner best or a potential new love is about to spring, this fun and quirky quiz will point you in the direction to truly wow them this Chap Goh Meh. 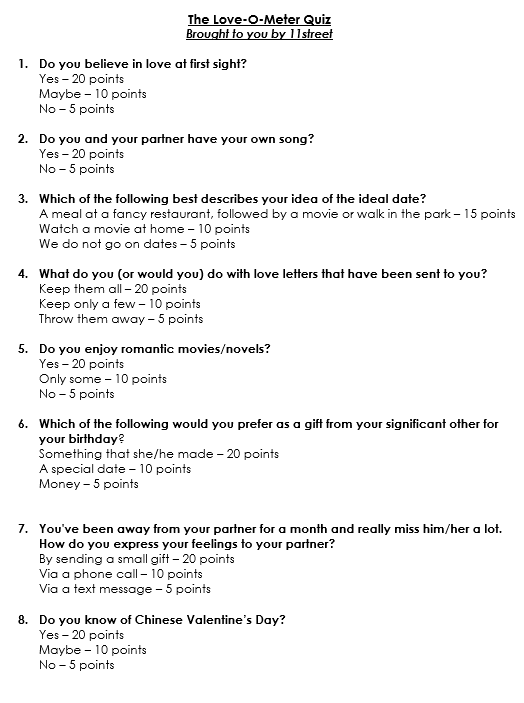 Let the ideas flow, as you find out what kind of romantics you – and your partner – are. Do click the photo for enlarge. Got your results? How about checking out our gift ideas below? When there is a purpose, there is a reason to do it. If you are the type of person who finds purpose behind everything and favours rationale over emotion, then you are a practical lovebird. For you, there are a multitude of ways to show your emotions, but logic is your bread and butter. Whether it’s setting the date for a pamper session at a salon for your significant other, or a full body massage to relieve stress from a work week, there is always something out there to show that you care. These are two great ways to spend some quality time, relaxing. If that’s not your cup of tea, you can always try a scrumptious buffet at a hotel, the limitless selection will leave you and your partner spoilt for choice, but hey, at least you’re spoilt for choice together. More passion than a passion fruit. You enjoy doing things with your significant other, capturing moments and showing them off. After all, what screams passion than showing off your perfect relationship. Whether it’s spending time at home, visiting a new café, or going to the movies, it’s a must to do it with your loved one. Because you enjoy your time together so much, you’d want time to slow down and maybe even come to a stop. It’s probably a safe bet to say that you’ve taken tons of photos together and would love to print some of them. A photobook is a great solution, and what’s more it’s customisable, so you can add some personal touches to it. If you prefer a little more hands-on approach, you could get an instant camera and compile all your photos in the bundled album, or even start your own scrapbook! There is no corner you will leave unexplored. You are adventurous. From rock-climbing to eating creepy-crawlies, anything that has an adventurous spin, you’re doing it. Better yet, you’re not doing it alone! There’s nothing better than creating new memories with the one you love, so you often embark on random road trips and both planned and unplanned holidays. You love to see new places and meet new faces, all with the company of your significant other. The more a couple does things together, the stronger the relationship, so why not tackle District 21 together? With 10 adventure attractions to choose from, there’s bound to be something the both of you can enjoy. What if you have a close group of friends and you’d like to show some family love? Well, how about something that can involve more than just couples – something like Bubble Sports. If your significant other enjoys something a little more tranquil, and you both enjoy the outdoors, you could opt for a hiking trip in Cameron Highlands, where you can greet the morning sun. Go “all in”, it’s all or nothing. Putting your heart, soul, mind and finances to the test, is the ultimate way you show you care. From planning every intricate detail to splurging on the biggest teddy, you are the hopeless romantic. Charming, confident and not afraid to express your feelings pretty much sums up who you are. You’re someone who isn’t shy to say how much you love your partner each and every single day of the year. Taking a trip to Langkawi is a great way to get away from the hustle and bustle of your daily lives, but for an unforgettable experience, you could go on a sunset cruise on a yacht. Cool breeze in your hair, a cold drink in your hand and your loved one in the other. That’s pretty romantic.